My approach to seasonal decorating has become much more strategic over the last year. I look for a bit higher quality items that can be combined differently to work in multiple seasons. With better basics, I can fill in with less expensive items, like candles, to complete each look. More options for the same money is always a win in my book. 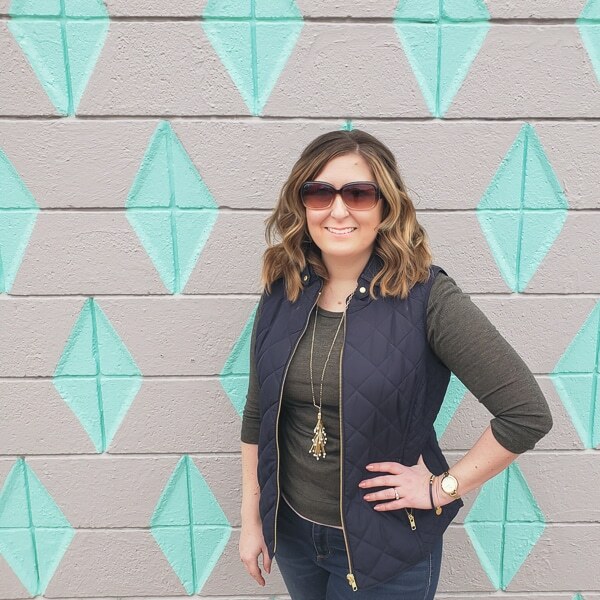 This new approach also means I can pull together a quick guilt-free “transition to fall” look to cover that time between summer fun and pumpkin season. Most of the decor I’m showing you will stay in place until Christmas, and then come back for post-Christmas through spring, but we’ll get to that as we go! Our “summer” living room and kitchen had inexpensive pops of teal added, which had a fresh airy feel. For fall and winter, I like things to be a bit cozier. I removed the teal accents before shopping for anything new, which made it easier to see which parts of the room needed some fall love. 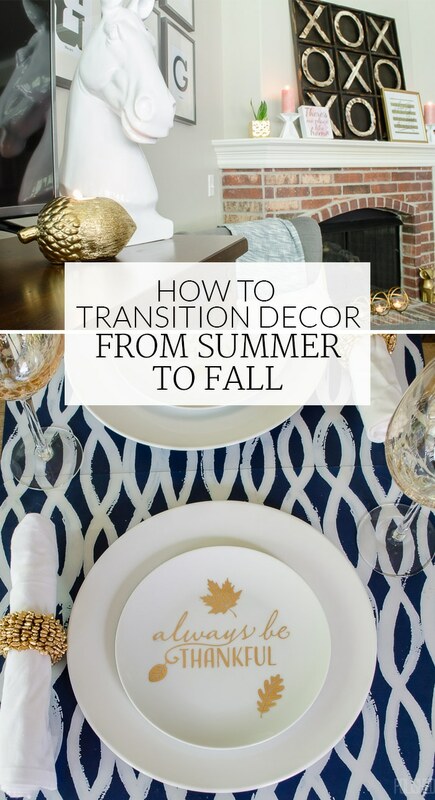 As I saw what a difference the decor updates had on the room, I realized I could narrow my process down to 5 small changes you can make to transition your home into fall. There isn’t much better around the house than a soft, fuzzy, warm blanket on a cool night. I found one at Pier 1 that was too cozy to pass up. Once I touched it, I knew it needed to come home with me. Most of the throws we had in the living room came from various Secret Santa Christmas exchanges. Which meant they were functional and cute, but didn’t necessarily match our style. Now, I can stay warm and keep the living room looking good at the same time. Plus, the chic neutral color will work beyond fall, which fit right into my plan of adding decor that transitions through multiple seasons. 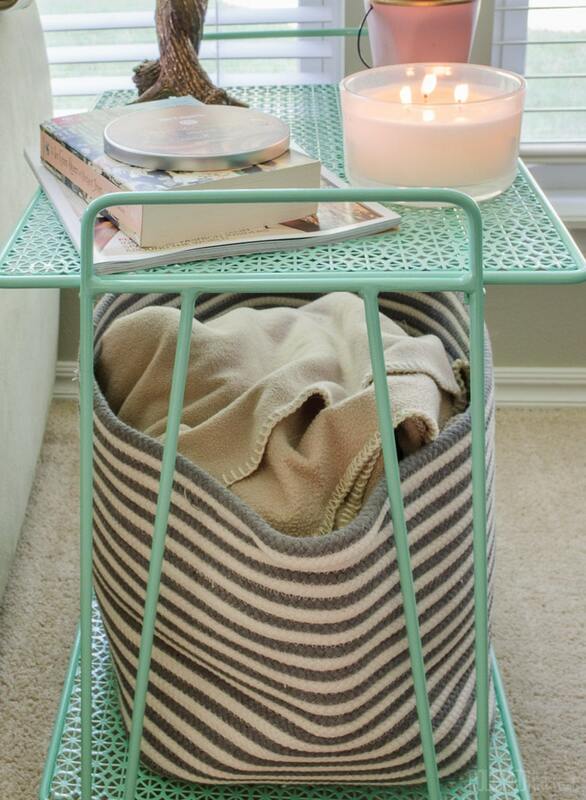 I also added a basket to hold extra blankets beside the couch. This is WAY better than the old system of hiding them on the floor in the corner behind the sectional couch. I found a Sugared Cinnamon candle at Pier 1 and it smells just as good as the Cinnamon Sugar pecans I make every year. Seriously, everyone needs a few of these around. So good. Swapping out summer tropical scents for fall scents changed the feel of the living room before I even moved a pillow. In addition to delicious smelling candles, there are also tons of chic candle holders that add fall style without a huge money or space commitment. 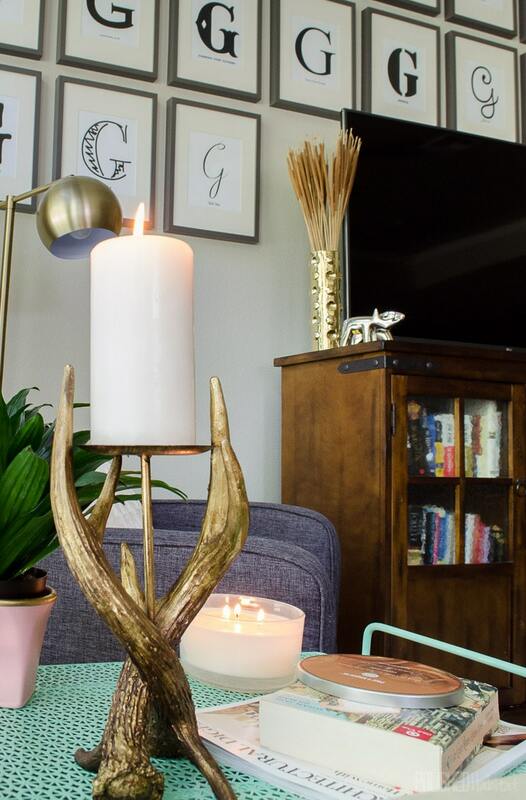 My current favorite is this gorgeous gold antler pillar holder! 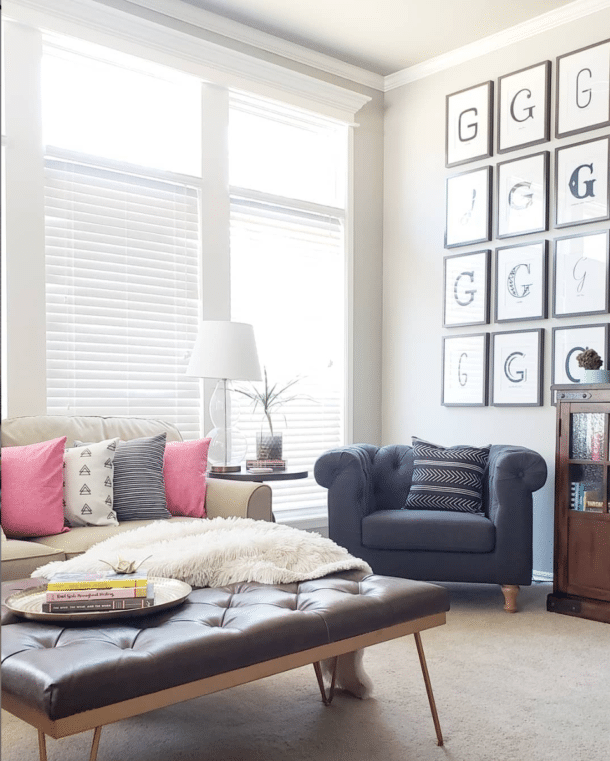 This is another 5 minute fix that updates the feel of a room pretty dramatically. For spring and summer, I had several pillows with teals and pinks in them. Most of them were technically outdoor pillows, so they weren’t the softest. Those are now packed away in favor of warm, comfy pillows. Hooray! The new blue (indigo) pillows will stay out year round, just paired with different accent pillows. I’m loving their size, softness, and color! 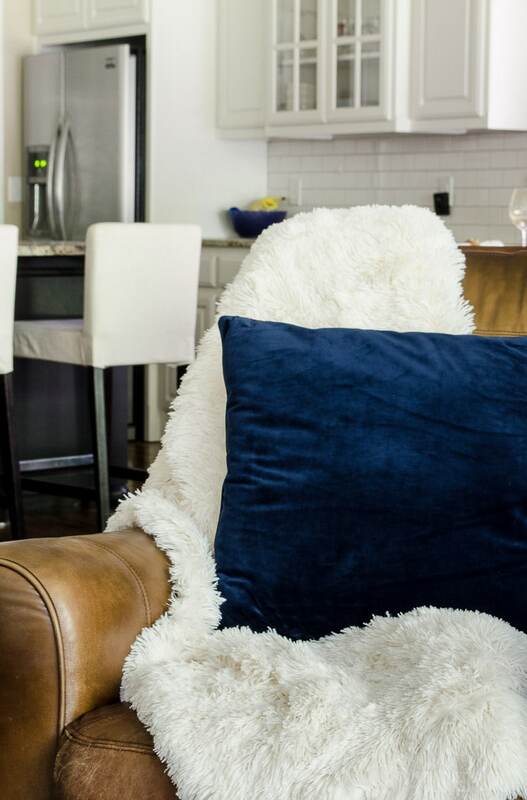 For fall, I used them with a couple of fuzzy pillows, which add more warmth and texture to the room. They’ll stick around until spring is sprung. I told you I was obsessed with adding things that stretched seasons! 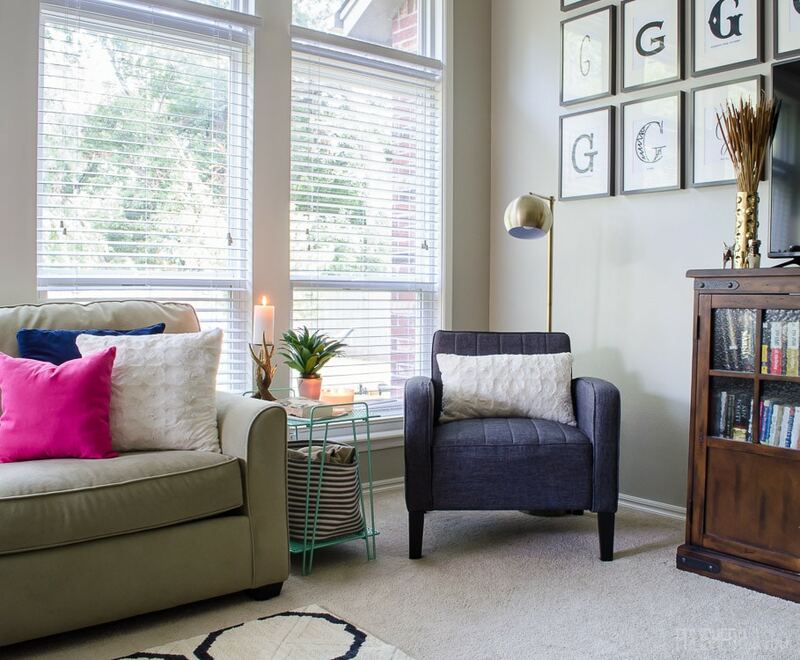 If you’re a normal reader, you know I’ll use any excuse to glam up a space! But, really, it’s not just me this time. 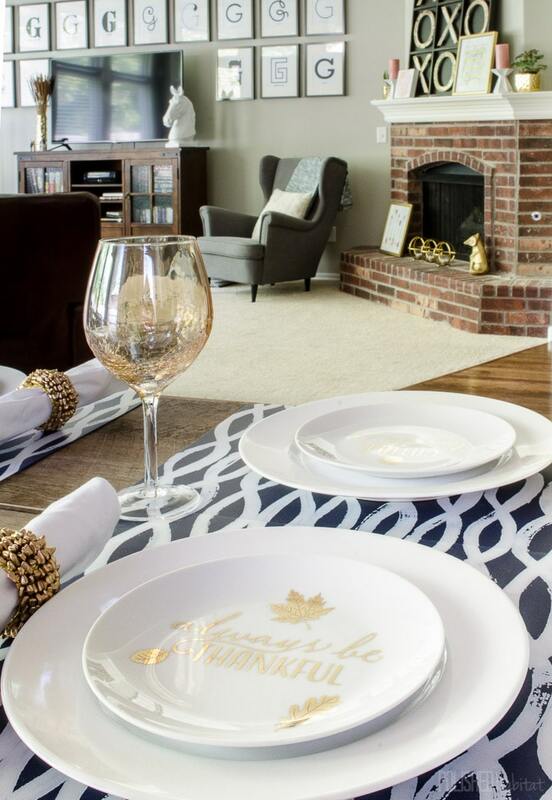 The beginning of fall is the perfect time to add metallics to your decor. 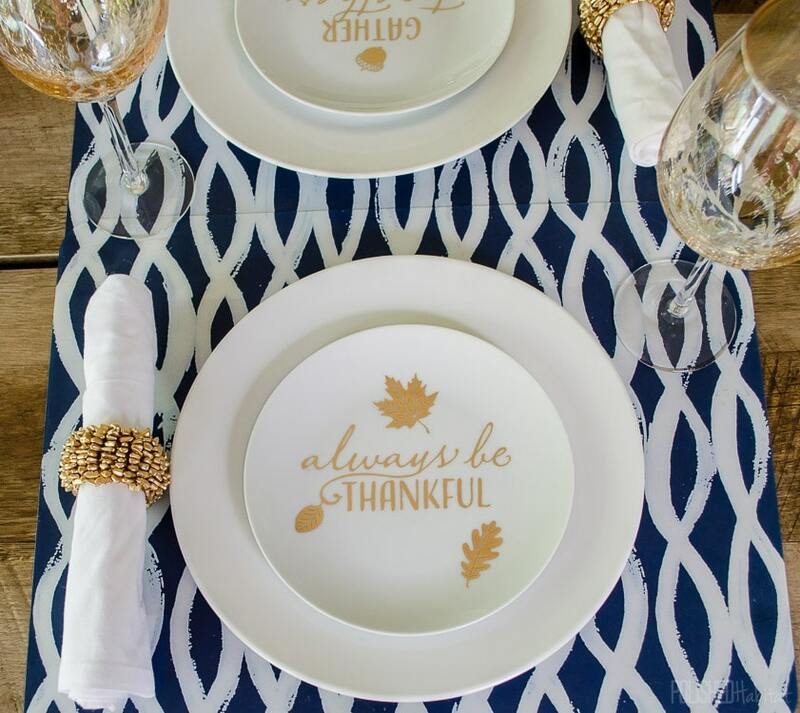 For our kitchen nook, I found the best gold leaf salad plates. Each plate is different, so I’m still deciding if I could display them somewhere on a wall. I love them that much! In the meantime, I put together a simple place setting using the plates, napkin rings, and wine glasses from my spring table. Along with the glam plates, I picked up a great golden acorn. 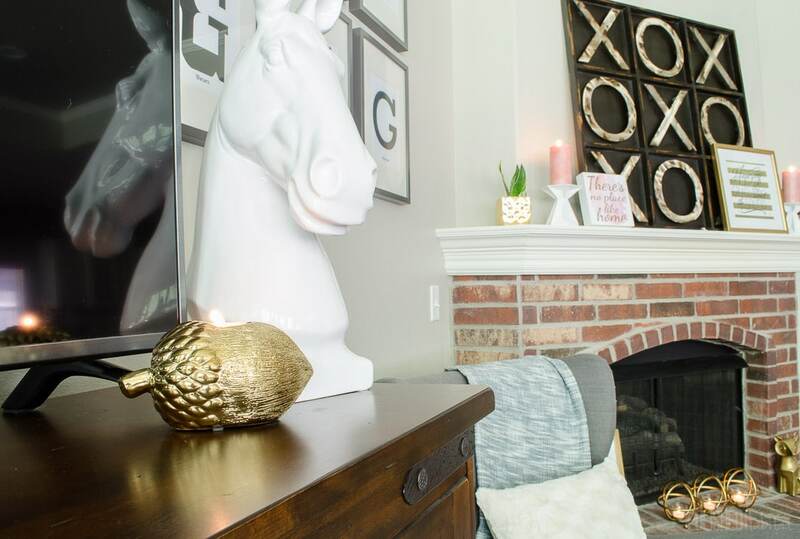 Because who doesn’t need to start fall with a chic gold acorn for under $10? 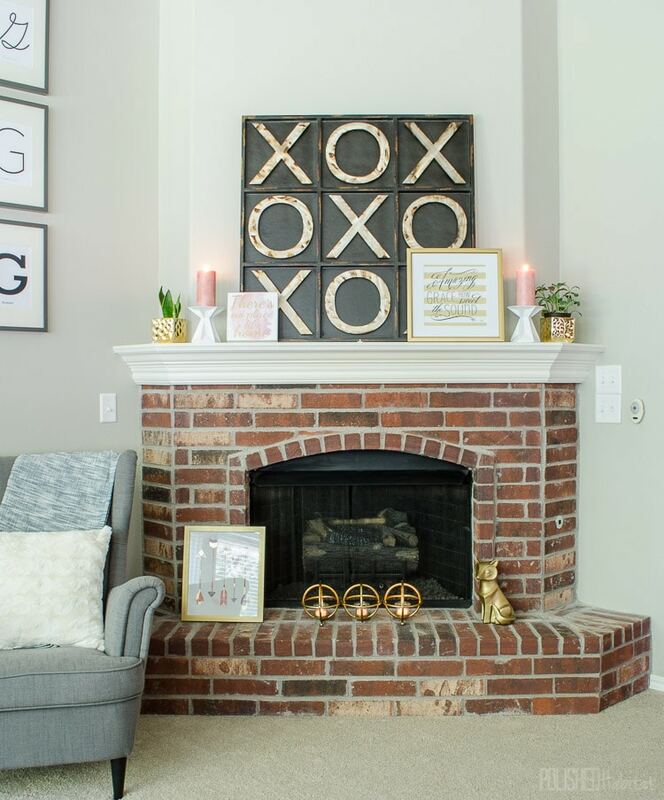 The last tip for transitioning to fall is to focus on the fireplace if you’ve got one. During the hot summer, I don’t even want to think about a fire. For fall, I love that the mantel is the perfect place to bring in warmth, metallics, AND candles. I gathered gold and white accents from around the house and was able to put together a cute early fall mantel without spending a dime. The pink candles came from our bedroom and both the art and tealight holder were borrowed from our bathroom. You may have also noticed the gray chair is back in the living room from the bedroom. We still haven’t found the perfect bedroom chair, but I’m okay knowing the house is a work in progress. Instead of worrying about the empty spaces where I’ve moved things to other rooms, I’m grateful for things I have that can be shifted around to create different looks. I think that process is what made me so aware of the importance of spending most of my decor budget on things that work for multiple seasons. I used to impulse buy sale and clearance items more often, but I’d rather spend that money with much more intention. Which doesn’t mean never buying season specific things either. 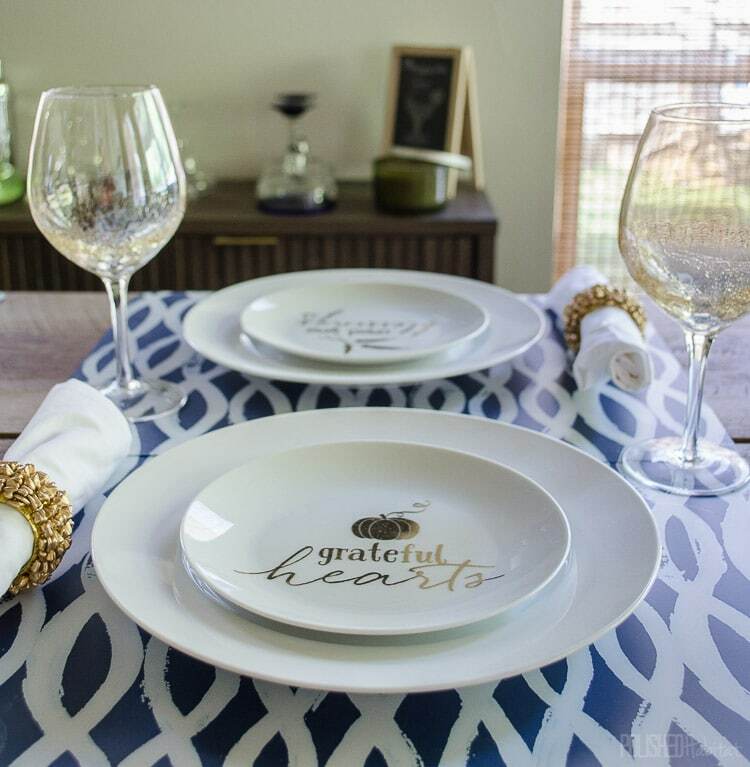 As you saw, I’m in love with the Give Thanks plates. It just means passing up some really cute items that don’t match the rest of our decor, so I can afford to continue the process of turning our house into a cohesive home. As we get into October, I’ll do some more minor swaps. I’ll remove the pinks from the mantel and add in some pumpkins, and maybe even find the perfect spot for this Mercury Glass Pumpkin Jar. The pink pillow from the couch will also get put away until spring, and replaced with something fun like this gold deer. Don’t you love that it would work for fall and Christmas? 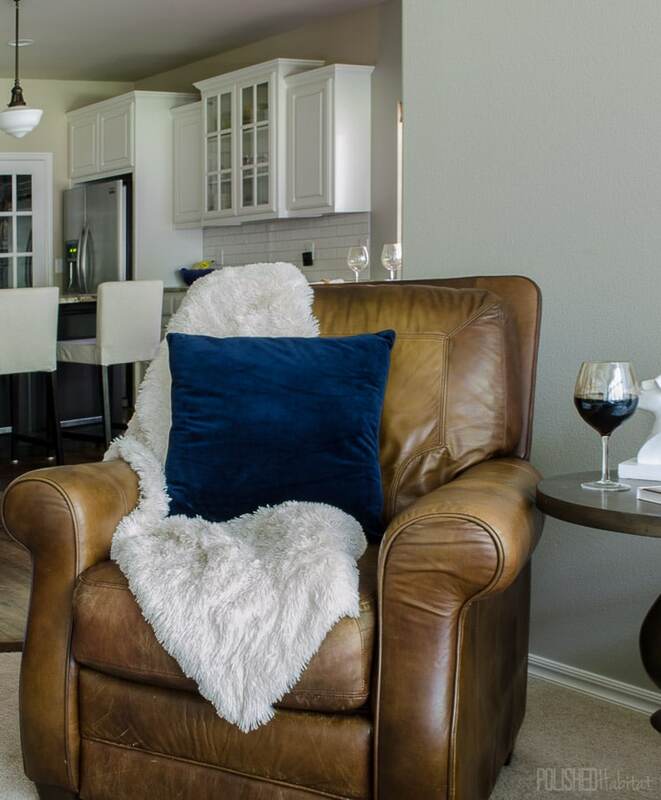 Until then, you can find me here curled up with my new sherpa blanket watching football. I love fall! That blanket! Love it! We so need new blankets around our house. It is SO worth the splurge. I don’t know why I always defaulted to being very stingy with what I would pay for a throw because I use them daily. I’ve been trying to become more aware of the things we use most often and put more budget towards them. Before it was so random what I would splurge on and what I’d fight to save every penny on.